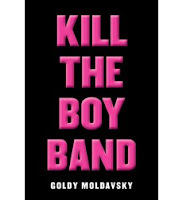 Original Content: "Kill The Boy Band." Now That's Different. I read this review earlier, and decided not to pick it up. I'm also pretty crap at 80's references, so it's probably just as well. In Apple's case, I wasn't aware of her size right away. She was the rich girl. Throughout the book, she's the spoiled child of a wealthy couple, the girl who doesn't have to know much because she's so privileged. It's her wealth that gets them into the hotel. It's her housekeeper who gets the room for them. Additionally, as with all the girl characters, Apple's fan behavior is so extreme that it, I believe, overwhelms the weight issue.